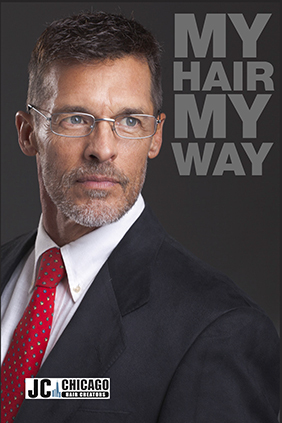 Backed by over 36 years of hands-on experience, JC Chicago Hair Creators is your leader in hair replacement. We specialize in treating hair loss, receding hairlines, thinning hair and baldness, and we’re in the business of providing all of our customers with a renewed sense of happiness and self-confidence. We are State Board of Cosmetology Licensed. We are Nevada State Business Licensed. We are certified by the Medical Hair Institute as a Hair Restoration Consultant. We perform hair loss restoration services that are completely non-invasive! We consult with you to make sure you’re getting the hair you deserve. Losing your hair can be a devastating blow to a person’s self-confidence and one that’s not easily overcome without some professional help… but with all of the pills, hairpieces, treatments, gels and more out there, how can you ever hope to know where to begin looking for help? Well, at JC Chicago Hair Creators, we make it easy for you to stop and reverse your hair loss in Las Vegas, without putting you through the ringer of expensive products or procedures. We offer hair loss restoration in Las Vegas through hair replacement: a revolutionary method that doesn’t involve any invasive procedures or sensitive chemicals! It’s as simple as walking in for your appointment and walking out with a lush, full head of hair!